CLEVELAND — The Cleveland Clinic and Boston University Medical Center offered a look at some of the ways they are deploying technologies to strengthen the patient experience here at the Patient Experience Summit. Empathy was the overarching theme at the Cleveland Clinic event. 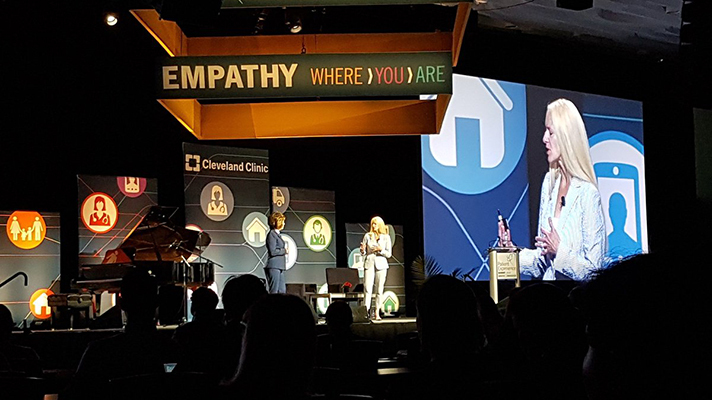 Adrienne Boissy, MD, Cleveland Clinic Chief Experience Officer and chair of the conference, said the purpose of the conference, in fact, is to “keep us anchored in empathy” and to help the attendees become what she called empathy amplifiers. To that end, Boston University Medical Center researchers presented the results of a project based on a virtual coaching app. “When patients leave the hospital, in our studies, when we ask them what they are most worried about, they say that, 'I'm all by myself,'" said Brian Jack, MD, Professor of Family Medicine at Boston University Medical Center said here at the Cleveland Clinic Patient Experience Summit. Jack and Richard Bootes, VP Product Development, at vendor TeleHealth Services, said that they realized early on that patient education was ineffective due to difficulty absorbing information while recovering and preparing to go home, as well as hospital factors, notably nurses lacking the time or priority to focus on discharge education. Their solution was to create an avatar-based virtual coaching app customized to patient needs with related educational resources, they said. Jack and Bootes reported that not only did the app and program reduce readmissions but it also improved satisfaction surveys — and patients indicated that the avatar was empathetic. Continuing the empathy theme, Amanda Todorovich, Senior Director of Content & Creative Services and Scott Mowery, Senior Director of Digital Marketing, presented capabilities that enable voice search and virtual reality from Cleveland Clinic’s website, as well a range of tools for optimizing patient experience, including Appointment Pass (enabling the patient to check themselves into appointments), Online scheduling, Star ratings, Physician bios, and displaying wait times for their walk-in clinics. They also said Cleveland Clinic has seen early success in improving patient experience via podcasts on specific medical topics and interview with physicians on treatments for specific conditions has been successful using Facebook live. Looking to the future, Cleveland Clinic is evaluating chatbots to help answer basic questions that patients have in an interactive format. Boissy asked the big question many hospitals and innovators are working to answer. John Sharp is Senior Manager at the HIMSS Personal Connected Health Alliance.